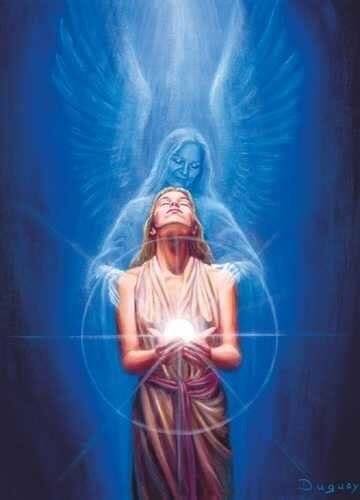 The transfer of energy from one being to another is the essence of a pass, as it is known in Spiritism. Passes revitalize our Vital Fluids so we may be stronger to face our daily trials. For if we don’t place ourselves in a balanced state, we have less control over our emotions and our body is less able to heal itself. Your body utilizes Vital Fluids, which is a modification of the Universal Fluids that make up everything in the Universe, these are altered to fit your own spirit and body. Vital Fluid can be thought as an energy force that maintains the various Force centers, otherwise known as Chakras, which are responsible for keeping all of your bodily functions in harmony. The more Vital Fluids you have, the healthier and more vitality you will possess. A benefactor spirit transfers their fluids that they direct from Universal Fluids, into their own spirit. Next the benefactor spirit directs the flow to the physical person applying the passes. 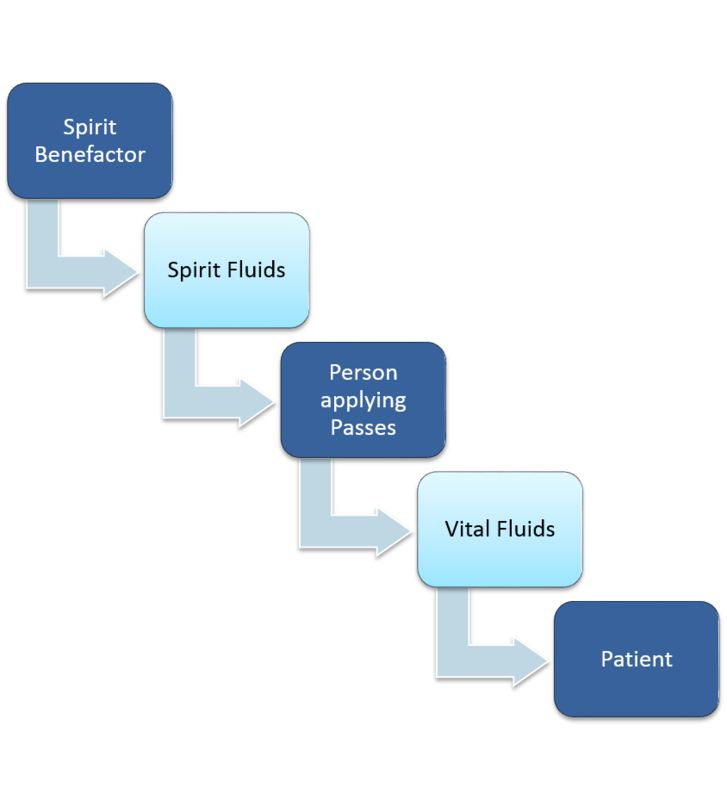 The person’s perispirit and body transform the fluids from the spirit to Vital Fluids that conform to the patient’s requirements. Thereby, customizing the form of energy to help the patient into the exact type they need. This transfer of Vital Fluids is done with the assistance of two beings. One is the loving and caring spirit who uses the physical person giving the passes as a channel to supply you with energy. The person giving the passes must be in harmony and full of goodwill toward their fellow beings. As the picture below illustrates, the spirit stands behind the pass giver who stands in front of you to deliver the vital fluids. I have received passes and I have definitely felt better. Could this just be all in my own mind and I wanted to feel better? 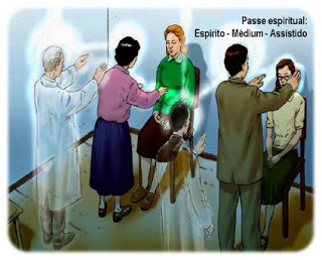 Yes, that could be one explanation, but with the other phenomena I have witnessed with Spiritism, I am a believer in ability of the spirit world to help us in every way possible so we may overcome our trials during our life. As covered above, Passes are given to help a person recover their balance, the harmony of their spirit, perispirit and physical body. The paragraph is eerily similar to my life before I discovered Spiritism. They could have replaced the word “person” with my name and been spot on. I wasn’t been able to control my emotions, I was in a situation with no support and my life was completely absence of prayer or even the acknowledgment of the love of God and Jesus. Hence, I was fat, well I am still overweight, but before even worse, had high blood pressure, headaches, and when I caught any illness it lingered for quite a while. Even though, I still get sick occasionally, when I do I recover quickly, my blood pressure is normal and my stress levels are very manageable. I can’t remember my last headache. Does my experience prove anything, no of course not, it could all be a coincidence. But since discovering Spiritism, I am less certain of anything that could be labelled a “coincidence”. Once you come to the realization that we exist in a glass cage, where we go about our business blind to the presence of our mentors, you start to notice the small and large effects that push and pull you like the rolling waves in the middle of the ocean. There is no discrimination amongst the many religions of the earth, all who profess a belief in God and try to light a path of love and goodness shall receive care from the spiritual realm. Hence, anyone with any connection to their spiritual side will be noticed and aided by the spirit world. Only those who are completely trapped by their overwhelming materialistic thinking and behavior, or a glaring absence of love for their fellow beings are left to fend on their own. The rest of us are being supported on a frequent basis. When you wake up astonishingly refreshed after a hard day or find that one more bit of energy to survive your current trial that could be the spirit world, pushing you on with an invisible hand. A hand of warmth and love, a hand forged in the same trials which we have all been through. How are Spirits and People Trained to Give Passes? Therefore, the spirit workers undergo rigorous training to fulfill their mission. While incarnates must possess an understanding of the Doctrine of Spiritism and the required goodwill toward their fellow beings. To receive passes, requires only faith and openness to allow the refreshing waves to be absorbed into your body. As one can see, our bodies are finely tuned instruments, which are capable of actions beyond our imagination. We don’t exist only to feed ourselves and procreate, but we are first and foremost devices for good, for not only by our thoughts and actions, but by maintaining the emotional and physical health of our physical covering while we are doing our time on earth. For this vehicle that our spirit presently resides can do more than move us around in space, but is also capable of transmissions of life altering rays, benefiting our fellow humans. The old saying, our body is a temple, is accurate. We have been bequeathed this divine apparatus to use wisely, not to abuse in a thoughtless manner. When we are assigned our trial on earth, our body is also allocated to us, much like textbooks at the start of a class. As in the school room, we are expected to keep our materials in good shape and to use them sensibly. Which brings us to the limit of patience extended to us by the spirit domain. As happens to us when we ignore repeated warnings, our friends give up and remain silent. Knowing in their hearts that it is a pity we are on the wrong path, but they realize that some people only learn by suffering the results of their actions. The spirit world does the same. Hence the man is going to Spiritist lectures, reading the books and yet has not modified his behavior. He will be allowed time to come around, if he begins to take the messages of love, caring, and honesty to heart, he will once again be treated with healing passes. We are supplied more help than we can imagine in our lives, but if we ignore the yellow flags that we have speedily passed by, then we shall be allowed the opportunity to learn the hard way. Hopefully, when we do ride down into that ditch, we will acknowledge our faults and work to better ourselves. On the other hand, if we blindly travel on, oblivious of the multitude of ominous signs, we shall have the occasion to look back at our life and try to progress in our next reincarnation. Learn more about Spiritism and how it can give your life meaning and spiritual health; read my introductory book Spiritism 101 – The 3rd Revelation. May I request for a powerpoint presentation Re: Passes- Why, How, What. I intend to have it translated to the Filipino Language.